Produced by an American-made tobacco company, SX Brands. 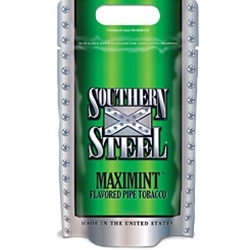 Each flavor of Southern Steel Pipe Tobacco offers a unique bold flavor with a smooth blend made with versatile southern tobacco ingredients. Packaged up at a reasonably-priced durable, re-sealable foil pouch. Each Southern Steel is guaranteed to be fresh, ready to be shipped with a quality tobacco that delivers a superior smoking experience. Made rich with traditions straight from the South. Try Southern Steel today. Offered here at Smokers Discounts.